Boeing has started flight testing its laser gunship program. Two important milestones were achieved: flight testing for its Advanced Tactical Laser (ATL) Advanced Concept Technology Demonstration (ACTD) program and "first light" for ATL's high-energy chemical laser in ground tests. The ATL ACTD program is intended to combine the two advanced technologies referred to above. The ATL uses a closed-cycle, chemical oxygen-iodine laser (COIL) with beam control. The ATL will be able to engage tactical targets from a moving platform at ranges of approximately 10 kilometers. It can spot a ten-centimeter-wide beam on a distant target for up to 100 shots. This beam has enough power to slice through metal at a distance of nine miles. Boeing tested the ATL system for the first time in ground tests on September 21st. This "first light" test will be followed by repeated testing this fall. The second component of the program is the on-board visible and infrared surveillance and acquisition sensors that provide the weapon operator with images for finding, identifying and engaging targets from a moving platform. 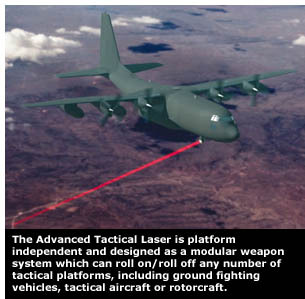 This portion of the laser gunship program was tested using a C-130H from the U.S. Air Force 46th Test Wing. The platform hardware tested includes the beam director and optical control bench, which will direct the laser beam to its target; weapon system consoles, which will display high-resolution imagery and enable the tracking of targets; and sensors. In 2007, Boeing is on track to install the ATL on the aircraft and fire it in-flight at mission-representative ground targets. The laser will be fired through a rotating turret fifty centimeters in diameter. When operational, the ATL ACTD will be able to target and disable or destroy targets with little or no collateral damage. It is expected that the device will be usable on the battlefield or in urban operations. 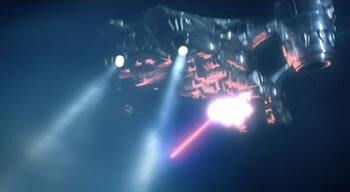 The logical endproduct of the ATL ACTD is shown in the picture above, taken from the 1991 film Terminator 2, directed by James Cameron. These laser gunships manuever easily in (blasted) urban terrain. This robotic sentry gun is designed to detect and if necessary fire upon intruders. Modular Disc-Wing (Frisbee) Urban Cruise Munitions under development by Triton Systems. The Pentagon is now developing active electronically scanned array (AESA) radars that could be used as weapons. Read more about the Advanced Tactical Laser Advanced Concept Technology Demonstration (ATL ACTD) and in this news release.